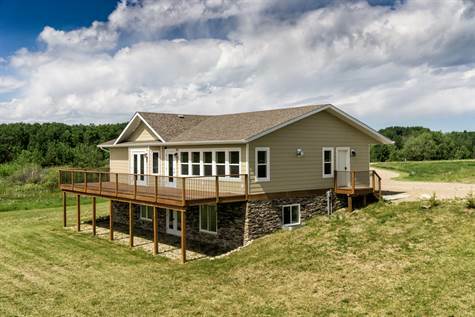 This gorgeous 2014 build is situated on a 2.27A parcel overlooking a natural pond with incredible views. Designed with an open style concept in mind, the main floor offers an abundance of space, vaulted ceilings, and a beautiful modern colour scheme throughout. The kitchen features granite counters, plenty of storage and an abundance of cupboards. The stone gas fireplace is a beautiful focal point in the living room surrounded by windows for natural light and breathtaking views. With the main floor measuring 1632sqft and a full walkout basement ready for your imagination, this 3 bedroom home was designed with comfort in mind. Call today to book a private showing.